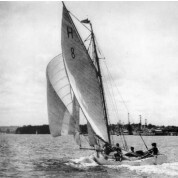 Her first sinking was in 1921 during a Saturday afternoon race to Waiheke Island. Built in 1908 by Logan Bros, Celox was a classic mullet boat, twenty-six feet long and well known to anyone who has frequented Matauwhi Bay over the last few decades. She featured in many a Russell Boating Club race, being first owned and raced by Fuzz Ellis. Joe Cotton was the next owner, then John Grant. Celox competed in the Tall ships Race this year, sailed by her current owner. Just over a week ago on a moonlit night she struck a rock at the Cavallis and sank, for the second time. Fortunately on this occasion, no lives were lost. In 1921 the then owner and his five year old son both drowned when Celox was struck by a sudden squall within a few minutes of the race finish. With a big following sea she wouldn’t answer the helm and with the centre board up the boat broached, heeled over and sank in about half a minute, in 12 fathoms of water. On that occasion she was salvaged and restored.